Solid modeling (a.k.a. 3D CAD) has revolutionized the way that motorcycles and other products are engineered. What was once drawn by hand with triangles, scales, and other arcane tools is now created virtually within a computer software environment. All of the structural members, drivetrain, and other mechanisms in your late model Guzzi were first modeled in a program such as Solidworks, Pro/ Engineer, CATIA, or another 3D CAD package before they were actually built. This process reduces design (and re-design!) times, allows for analysis of components before they are built, and adds to the quality of the finished product. What’s really amazing is what can be accomplished after a system or part is modeled, as stress/strain, vibration, fluid dynamics, or similar analyses can be performed. “Yeah, yeah, yeah, so how does this apply to my Guzzi?” you may be asking. Let’s say that you want to quantify the effects of some design changes on your Guzzi’s flywheel, i.e. how the mass moment of inertia is altered by a typical lightening job. [As you may remember from a previous column, mass moment of inertia is related, but not equal to the weight of a rotating object. MMOI determines how fast the object will accelerate in a rotational direction for a given a torque input.] 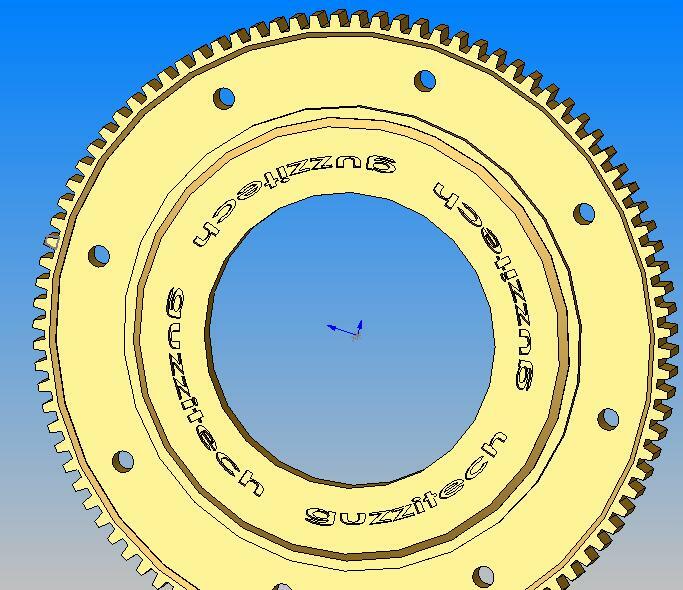 Measuring inertia is a bit more complicated than measuring weight…unless you have access to CAD software, that is. Once an object is modeled, and a material density is assigned to it in the software, it is a simple matter to measure inertia, center of gravity, and similar properties. 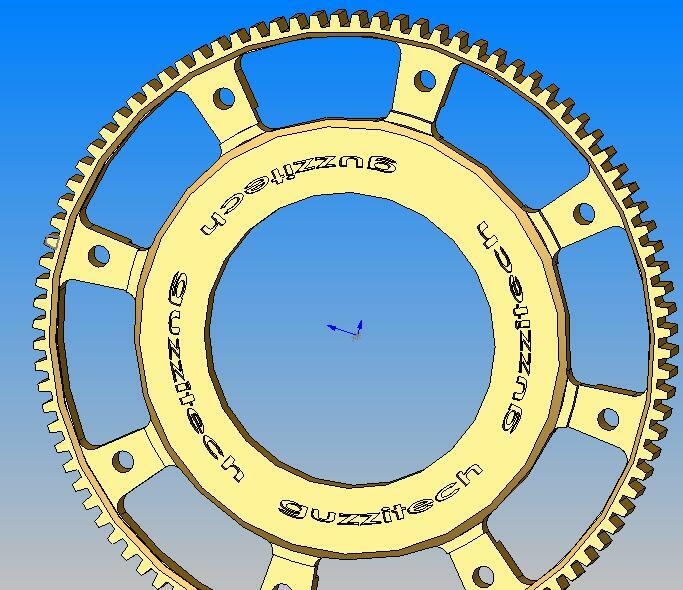 Figures 1 and 2 show a modeled flywheel and ring gear assembly from a typical Guzzi Lemans 850 or 1000. Each of these figures took only an hour or two to draw using Solidworks, a typical 3d CAD software package. Figures 3 and 4 represent the flywheel and ring gear after a typical lightening job. Note that the most significant material has been removed from the outer perimeter of the items- where it most influences the object’s inertia. 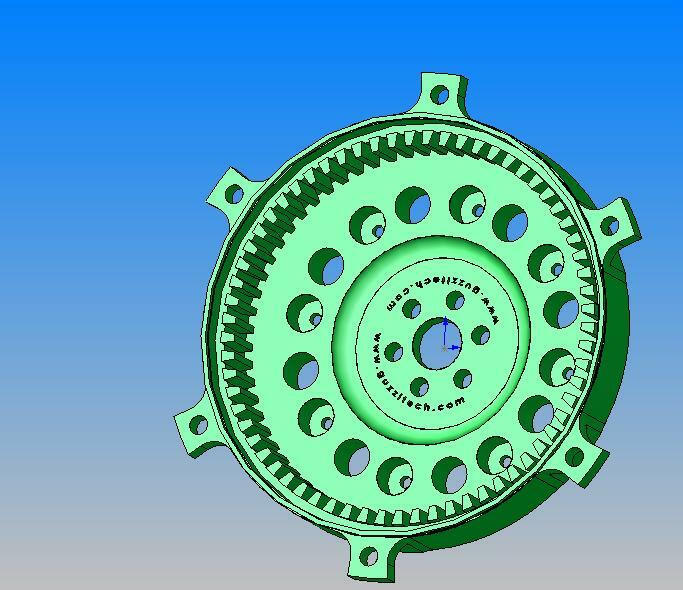 In the case of the flywheel, the lightening has decreased the flywheel’s weight from 3.38 kilograms to 2.28 kg (33 % reduction of total weight) According to the software. Solidworks predicts that this lightening will decrease mass moment of inertia from 2.15x10^4 kg-mm^2 to 1.11x10^4 kg-mm^2 (48 % reduction of MMOI). The software generates this prediction by adding together the many small elements that comprise the part. Note that a smaller percentage reduction in weight translates to a larger percentage decrease in inertia. This is the expected result. In summary, a 33% reduction in weight of the flywheel will result in a 48% increase in how quick the flywheel alone can rev up. Woo hoo! Similarly, lightening has decreased the ring gear’s weight from 2.23 kg to 1.36 kg (39% reduction of total weight). Solidworks predicts that this lightening will decrease mass moment of inertia from 1.99x10^4 grams-mm^2 to 1.12x10^4 grams-mm^2 (44% reduction of MMOI). Validation of engineering results is an important step in a modeling or measurement process. 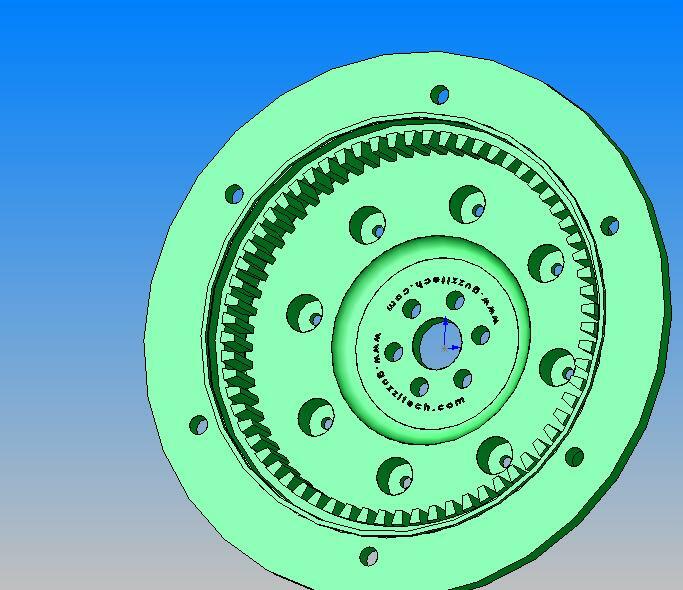 In this case, the software predicts a weight of 3.38 kg for the stock flywheel, while the actual piece that this model was based on weighs 3.33 kg (a mere 2% difference). This is well within an expected error bound. Thus, there is a good degree of certainty that the flywheel model is accurate. A similar comparison between the stock ring gear model and actual item shows a 1% difference, which is also acceptable. Figure 5 summarizes these results. As already mentioned, inertia can also be measured physically, but the process is not as easy as placing items on a scale. One way to make the measurement is to suspend the object from two wires, set it into rotational motion by hand. The period of oscillation is measured and used to derive the inertia in the direction of rotation. This is called the bifilar pendulum technique. This pendulum technique is still used to measure inertia in applications when actual physical testing of an object is required, or when the object is sufficiently complex that accurate modeling would be too time consuming. I’ve used the bifilar pendulum technique to measure the principal inertias of an entire 800lb motorcycle. In this case, it would have taken a few weeks to model the entire motorcycle frame, engine and subsystems in a CAD package. The lab measurement took maybe four hours, though. The pendulum technique could also be used to measure our example flywheel’s mass moment of inertia if an actual physical test or a validation of our CAD model was desired. Indeed, there are still a majority of engineering tasks that computers can’t yet tackle as well as a dude with a toolbox and a white labcoat. For objects with simple geometry, however, CAD models produce results that are well within the accuracy of common engineering practice. Oh yeah…and for the metrically challenged, you can multiply kilograms by 2.20 to get pounds to make some sense of the above data.